In honor of the 25th anniversary of the debut of the book, KOTA Productions presents the stage adaptation of Lois Lowry’s Number the Stars. 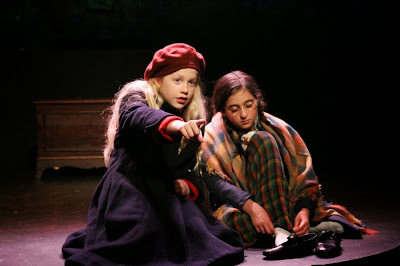 Written for the stage by Dr. Douglas W. Larche, Number the Stars follows ten-year-old Annemarie Johansen and she and her family as they aid in the reaching of safety of Danish Jews to Sweden during World War II. Directed by Laura Luc, KOTA’s production brings the Lowry historical fiction to life simply. With a rotating cast of youngsters to play Annemarie, her sister Kirstie, and their Jewish friend Ellen, this production exudes youthfulness. For my production, Violet Young as Annemarie portrayed a beautiful, honest performance. Alexa Valentino as Ellen was a bit soft-spoken but played well against Young’s Annemarie. Kyla Carter as Kirstie served as the comic relief but unfortunately hammed up too many moments with her cute delivery. Erika S. Lee as Mrs. Johansen gave a wonderful performance as the strong mother. Hamish Briggs as Mr. Johansen balanced well with Lee as the fun dad. James Tyler Kirk as Peter brought much courage to the character and had an equally strong report with the young kids. Director Luc used simplicity to tell the story. She used images projected on the back wall along with basic furniture pieces to help show location in the oft place-changing play. The only issue Luc came across was messy and mostly soundless transitions. With no sound to aid in the long furniture moving, they seemed to be covered up by unnecessary and distracting audience applause. The costumes by Lucy Luc evoked the time quite well. Despite some hard material for children to completely comprehend, Number the Stars still stands strong twenty-five years later. It’s a beautiful story that is wonderful piece for children’s theater.